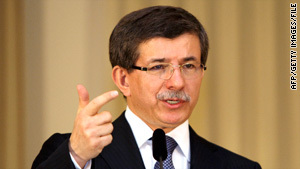 "Israel thinks it's above the law," Turkish Foreign Minister Ahmet Davutoglu said. Washington -- Turkey's foreign minister said Tuesday that his government is "not happy" with the U.S. response to Israel's raid on an aid flotilla carrying humanitarian goods bound for blockaded Gaza. "We expect full solidarity from the United States," Foreign Minister Ahmet Davutoglu said before a meeting with U.S. Secretary of State Hillary Clinton. "We are not happy with the U.S. statement from yesterday." Davutoglu called on the United States to condemn the attack, express solidarity with the families of the victims and exert pressure on Israel to free prisoners taken during the raid. "Israel thinks it's above the law," Davutoglu said. He warned that if some countries choose to follow the "rule of the jungle ... we know what to do." President Obama has expressed "deep regret" at the deaths caused by the incident and also "expressed the importance of learning all the facts and circumstances around this morning's tragic events as soon as possible," the White House said Monday. Israeli Prime Minister Benjamin Netanyahu canceled a scheduled meeting with Obama this week to return to Israel to manage the crisis. Turkey's ambassador to the United States, Namik Tan, called the U.S. response "sort of weak." It is not clear how many people died in Monday's pre-dawn raid. Israel put the number at nine but did not release the names of those who died. The Free Gaza Movement, one of the groups that organized the convoy of six ships, said the fatalities numbered higher but did not offer an exact number. Israel has said that several hundred activists seized during the raid have been transported to Beer Sheva prison in southern Israel. Forty-five have been released and were either deported or on their way to Ben Gurion International Airport in Tel Aviv. Those who remain detained have refused to identify themselves to Israeli immigration authorities, an Israeli Prison Authority spokesman said. None has been placed under arrest, he said. The Israeli attack has sparked protests in several countries and brought condemnation worldwide. Davutoglu said Tuesday that for Turks, the attack is psychologically "like 9/11." Turkey is historically Israel's closest Muslim ally in the Middle East. The Freedom Flotilla was organized by the Free Gaza Movement, a Cyprus-based human rights group, and the pro-Palestinian Turkish organization Insani Yardim Vakfi. The flotilla of six ships -- three passenger and three cargo vessels -- left Cyprus on Sunday, carrying more than 10,000 tons of aid and about 600 passengers from more than 20 countries, the movement said. Activists said they wanted to raise awareness of "the illegal siege of Gaza" by Israel, which instituted a blockade on Gaza in 2007.